Few would argue about the power and value of educational content – whether a blog, an e-newsletter, a white paper, or a how-to video. However, some brands have taken this concept further by developing full-fledged classes and curricula for their audiences. Let’s look at eight brands that give their audience opportunities to get an education in unique and entertaining ways. Renasant Bank, a 113-year-old Mississippi-based regional bank, had been offering financial literacy classes and support to local universities for some time. Although it didn’t need name recognition – the bank has that – it did want to find a way to be recognized as offering more than checking accounts. Two years ago, Renasant took a page from the popular TV show, Shark Tank. “For years, we’ve partnered with universities to do business competitions. After looking through their pitches, giving students ideas, and realizing that no one knows this is going on, we thought, ‘What if we got a partner to do a TV show?’” says John Oxford, Renasant’s director of corporate communications. The show, Brand New, was produced with the help of Mabus Agency, and aired its first episode in June 2017 on MPB, the Mississippi PBS affiliate. Students from the University of Mississippi, Mississippi State University, and Southern Mississippi submitted business ideas, which a panel of judges from Renasant and local business partners narrowed to six. Spotlights on those students, their ideas, and the competition that followed were filmed and featured in four 20-minute episodes. “Banks are often perceived as boring, but as far as content goes, you can help differentiate yourself by taking a calculated risk to show what your brand does,” says Oxford. The ability to distribute your story across multiple channels makes it even more effective, he adds. From conception to airing took about two years, with a production time of three to four months. “The challenge is always getting buy-in, but everyone at Renasant loved the idea. You don’t hear about a lot of banks doing things like this,” says Oxford. It helped that those involved in the project and the marketing for the show came up with a well-thought-out multifaceted concept, explains Oxford. “We are able to chop up segments and get shorter pieces of content to share on Facebook and various social media. We can also email it out to our customer base,” he says. Renasant not only helped create and produce the show, but it paid the prize money (a few thousand dollars) to each of three winners. “It was never a product campaign; it was a straight goodwill campaign. We want to be looked at as a partner that helps drive entrepreneurism in our state. Even though Mississippi is often looked at as rural, these students are coming up with ideas that are as cutting edge as anywhere,” says Oxford. 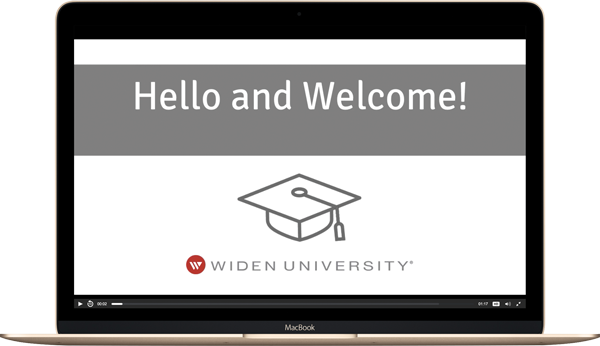 Widen, a digital asset management company, launched its educational arm WidenUniversity in 2014 to help customers master the complexities of topics like metadata, governance, and analytics. Through the educational portal, the company offers everything from free webinars to three-day paid live training courses. The sheer volume of educational content available to customers and buyers is a huge differentiator for Widen, says Courtney Roe, customer experience strategist. “Widen’s consistent delivery of high quality educational content builds trust and respect, and creates an affiliation deeper than simply using a tool from a software vendor,” adds Jake Athey, vice president of marketing. He says education has been core to Widen’s marketing and customer experience, as evidenced by its change in customer satisfaction measures over the last five years. “Widen’s Net Promoter score (an index that quantifies customers’ willingness to recommend a product/service to others) increased from 37 in 2014 to 56 in 2017,” he says. This year, it is launching Widen Essentials live training and hopes to see continued gains. Athey also attributes the company’s customer retention rate of greater than 96% and other marketing KPI growth in part to the educational efforts. For instance, between 2012 and 2016, the company’s primary lead collection channel grew by 35% year over year. And the new customer acquisition rate increased by 22.5% year over year in the same period. Schneider has earned its place as an energy industry thought leader, while generating direct revenue, brand affinity, and leads via its Energy University. With over 900,000 courses taken, and 200-plus course offerings in 13 languages, Energy University has found a lucrative way to capitalize on the massive library of content it already commissioned, plus its access to in-house domain experts to vet the curriculum. Thanks to the copious amounts of customer data Energy University collects at touchpoints in the learning management system, Schneider Electric is better able to understand who the potential customers are and their needs, so they can be matched to the right products and solutions. Zappos Insights began in 2008 when CEO Tony Hsieh offered headquarter tours, and public interest grew so rapidly Zappos needed a streamlined way to manage it. Today, Zappos Insights is an educational program, a membership community, and a professional “camp” designed around the company’s core mission of making work more fulfilling. Although it might be considered more employer branding than content marketing, the educational component contributes to the brand’s storytelling. For instance, the Mentor on Demand program allows companies and individuals to pay for a mentorship with top Zappos executives. There’s also a membership subscription online training model for those who want to learn about the organization. Apple always had its Genius Bar in retail locations, but recently it expanded its educational sessions. Now it offers in-depth training sessions in all 495 stores under the brand Today at Apple. Just check out your nearest Apple location and find 30- to 90-minute sessions on everything from How to Get Started with Coding and Watercolor and Brush Techniques to How To: Edit Video on Mac. 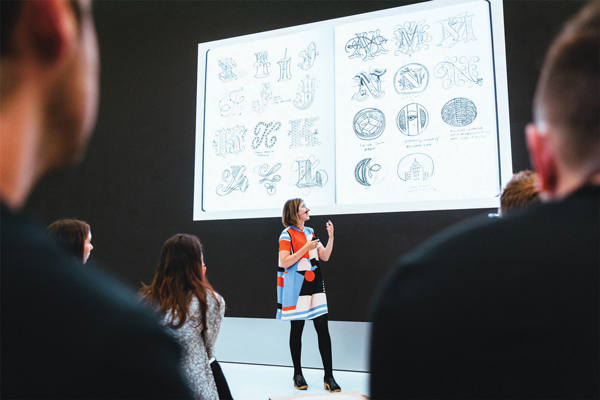 “At the heart of every Apple store is the desire to educate and inspire the communities we serve,” said Angela Ahrendts, Apple’s senior vice president of retail, in a press release announcing the initiative. 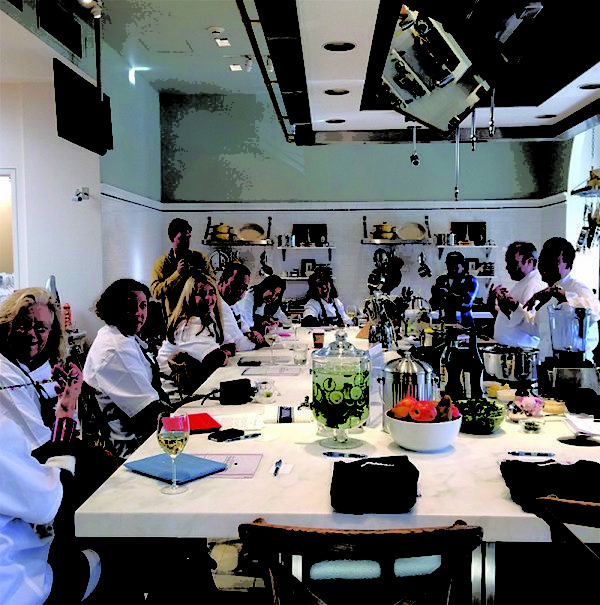 Williams Sonoma, the upscale cookware and bakeware retailer, has been offering on-site cooking classes and demonstrations for more than 50 years. Its 220 retail locations each feature special classes including “Knife Skills” and even “Junior Chef” classes. 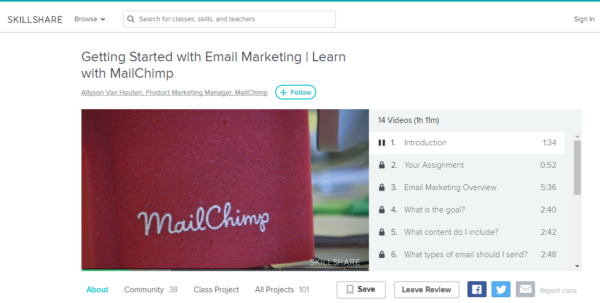 The email marketing platform MailChimp offers a variety of classes via SkillShare. Free courses include Getting Started with Online Marketing, which encompasses 14 short videos led by Allyson Van Houten, product marketing lead at MailChimp. Nearly 30,000 students have taken that course, which totals one hour and 11 minutes. The social media management tool Hootsuite offers free courses, which have been taken by more than 200,000 professionals. One intermediate course is titled Social Media Strategy – From A to Z. There is also a 40-hour Advanced Social Media Strategy Certification course for $999, which is created in partnership with Syracuse University’s renowned S.I. Newhouse School of Public Communications. To date, 30,000 people have earned a certification through the academy. 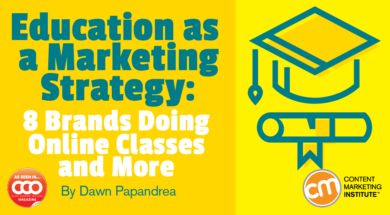 Many brands – both B2B and B2C – have a lot of educational content in a multitude of forms. But fewer brands curate that content (or create that content) with the intent of becoming recognized as an educator by their prospects and customers. To do it well, follow the footsteps of these eight brands. CMI offers educational opportunities too. CMI University hosts an exclusive online, go-at-your-own-pace curriculum to help you do your job better and grow your career. Register today. Enrollment is limited and ends December 15, 2017 for winter semester. This article originally appeared in the November issue of CCO magazine. Subscribe for your free print copy today.